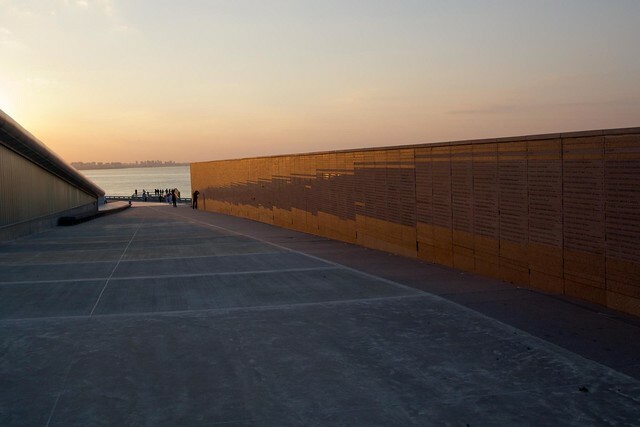 The Parque de la Memoria- Monumento a las Víctimas del Terrorismo de Estado is a relatively new space in the city that was inaugurated in 2007 as a memorial of the victims of the military dictatorship in the seventies. The park was designed by Estudio Baudizzone-Lestard-Varas and associate architects Claudio Ferrari and Daniel Becker. Its neat green landscape features sculptures by different artists, each reflecting on themes related to the park’s commemorative purpose. The location also hosts art exhibits that reflect upon these themes and there is an information archive. Although a bit out of the way, it is an interesting place to reflect upon Argentina’s history, and also as a city landmark with artistic value. An upcoming exhibit will be inaugurated this week featuring Chilean arpilleras, which are burlaps on which textile designs are applied to tell a story, or what cannot be spoken off. The exhibit will be open from the 28th of September to the 10th of November from Monday to Friday from 10am to 5pm and on weekends and national holidays from midday to 6pm. Av. Costanera Norte – Rafael Obligado 6745. This entry was posted in Where to Go, What to Do and tagged activities in Buenos Aires, argentina, buenos aires,, military coup, monuments, parque de la memoria, sculptures by Fierro Hotel Staff. Bookmark the permalink.